This Shade Sail Jaw - Jaw Turnbuckle Accessory is used for the installation and tensioning of shade sails. Made of stainless steel these turnbuckles will last many years. They can also be used in other areas where tension needs to be applied to fabrics, cable, rope or chain. 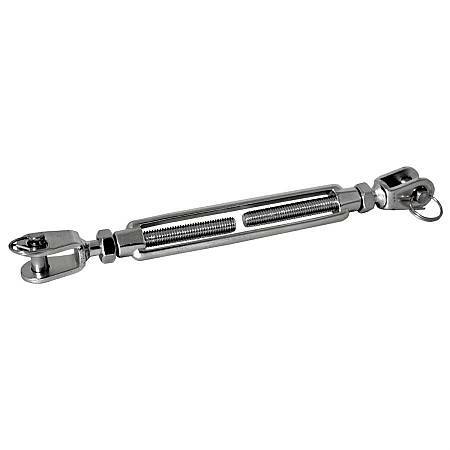 Fully closed the Turnbuckle measures 8 inches, fully open or extended the turnbuckle measures approximately 11 inches. High quality hardware is paramount for a proper shade sail instalation. Attachment hardware failures can cause damage to the sail and to property around the shade sail. This shade sail attachment and mounting hardware is manufactured with 304 marine quality stainless steel and is designed to be used in harsh environments like high winds and/or salt water environments.